Sometimes the to-do list is overwhelming. 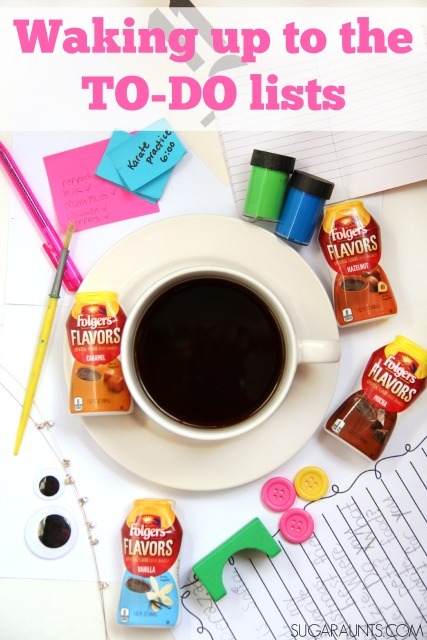 There's preschool pick-up, after school dance class, grocery list, work duties, laundry, grocery shopping. It can get overwhelming. The oh, so very boring items on the list seem to always be there. Whether you write out a list on sticky notes or keep an on-going checklist in your brain, it can get stressful! Then there is the dishwasher that needs unloading. Again. And that laundry basket that needs folding. Again. It seems like I've been in a flurry of rushing from list to list. Because my lists seem to get lost before all of the to-dos are checked off. And so then I write another one, but it is weirdly longer than the first one. Life with four littles is busy. Doing homework with the older two is an adventure. I set up the second grader with her math worksheet while helping the Kindergartener with his new sight words. They are learning so much. So fast! And while I catch my breath that my 8 year old is adding three double digits with re-grouping, the 4 year old spills a cup of water and the 17 month old decorates the living room with baby wipes, finds and hides the van keys, colors on the wall with crayons, and slips in the water spill. I wouldn't change it at all. The busyness of lists and the chaos of family life is a blessing. There are the pretty pictures of fun stuff we do on Instagram and the cute crafts we share on Facebook. But behind the pretty stuff is the busy, tired, always running, and happy mama. I kind of think the snuggles overpower all of the mess and spills. The cuteness of sleeping babies after 8:30 pm is also a secret re-charging time for overwhelmed moms. Ha! I am definitely going strong on the coffee when it comes to waking up with a full to-do list. Tackling the day and wrangling four little kids is not easy! The kiddos are charged and ready to go with just a bowl of cereal, but I have to admit that it takes a bit more for this sleepy mom. 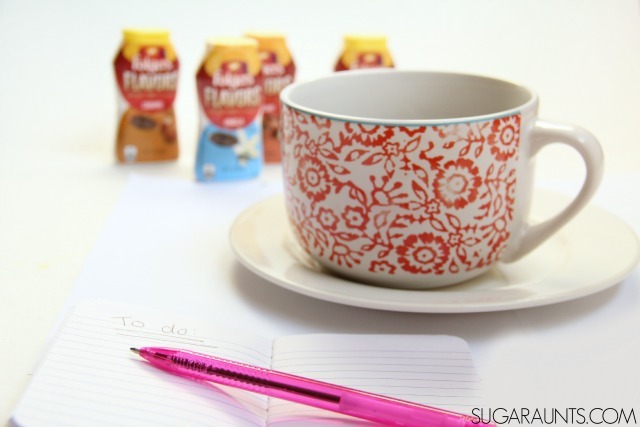 Recently I was sent Folgers Flavors and was super beyond excited to try them all. Do you wake up to more to-do lists? After the early (But why SO early??) morning snuggles from a certain 17 month old, there aren't many things that trump my morning coffee. 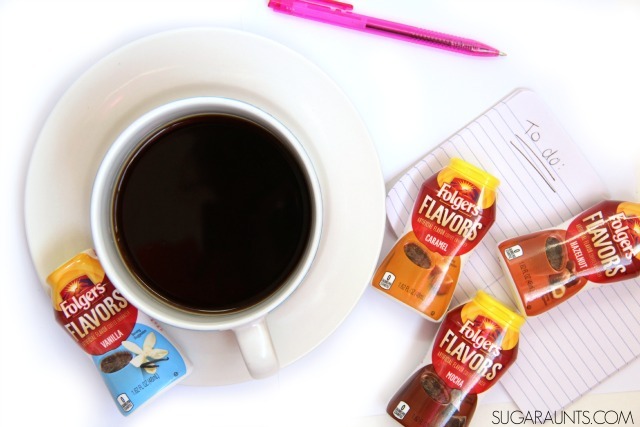 I am a try-all-the-flavors of coffee creamer kind of girl, so the four flavors I was sent from Folgers Flavors was pretty awesome. It was fun to try them all, and I felt like a kid in a caffeinated candy store. So, what did I think of the flavored concentrates? The squeezable bottle is conveniently small enough to fit in my over-full (but cleaning it is on my to-do list) cupboard. I loved that I could stash a bottle of the concentrate in my bag for a weekend away and add flavor to my morning coffee. The concentrates don't need refrigerating, so it's one less thing to worry about. Bonus! My favorite is the Mocha flavor (with both hot and cold coffee!) but the Vanilla, Hazelnut, and Caramel were really good, too.